Dodge the Cleaning and Have a Fun Night Out in Long Beach Instead! The weekend is finally here. Too bad you’re a responsible adult with a household to take care of and you can’t just leave your chores whenever you feel like it. But you also owe it to yourself to make spur-of-the-moment decisions during what little free time you have and enjoy yourself at least once a week. Luckily for you, you can leave your chores in the hands of a professional cleaning service Long Beach and immediately see for yourself that it was a really smart decision. We’ve checked out a few places for a night out that will make cleaning the last thing on your mind. Here’s our pick. If you want a romantic yet casual date night, do it like they (used to) do in the movies. Moonlight Movies on the Beach is one such place to go. Not only is it entirely free, but you’re free to bring your own blankets or chairs. You can bring food or buy some there as they have so many food options. That takes a dinner and a movie to a whole new level. They usually show classics, which is perfect if you want to take a trip down memory lane with your partner or rekindle an old flame. Even if you’re longing for a date night but have no one to leave your kids to, no worries – you can take them with you like so many families do. If you’re into something just a touch spooky, check out the Sunnyside Cemetery Movie Screenings. You’ll definitely be happy that you left the scrubbing to someone else to have such a unique movie night snuggling with your partner instead. A Night to Remember: Get Inked! If you want to take a walk on the wild side, Outer Limits Tattoo is a tattoo place in Long Beach that prides itself on being the oldest tattoo shop in the US. We admit this is a bit of an unusual recommendation for a night out, but if memorable is what you’re after, then this one’s for you. Perhaps you’ve been longing for a neat ornament to put on your skin, but could never really make up your mind and really go for it? With your home in someone else’s skilled and busy hands, get that tattoo you’ve always wanted. It can be as flashy or as subtle as you want it to be, it’s entirely up to you. Think of it as a walk through the ocean that is bound to leave you mesmerized. This one-of-a-kind aquarium boasts a collection of animals which inhabit various ever mysterious parts of the Pacific Ocean. 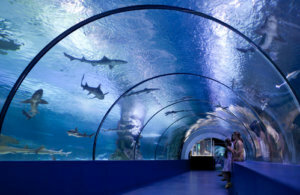 It is one of the biggest aquariums in the US and home to over 11.000 animals or over 500 awe-inspiring species. Your visit to the aquarium can be a wonderful learning experience for you and your kids before heading to dinner to one of the myriad Long Beach restaurants with their superb range of culinary choices. It’s not impossible to have your house cleaned and make the best of your weekend and the same time! With MaidThis! you can book an outstanding cleaning service in Long Beach or anywhere in Orange County and Los Angeles in less than 60 seconds! Start planning your weekend of fun now!